One of the nice things about travelling with my parents is that we meet lots of people. I tend to “mind my own business” when I go out; for my parents, everyone’s a friend they haven’t met yet. Even in the Big Apple, they proved amazing people are around every corner. We met cabbies, waiters, artisans, shop keepers, designers, restaurateurs and celebrities. So it was no surprise that while I popped into a pet supply store in SoHo, my parents were making friends with a shop keeper across the street. We were treated to a history lesson and tour of mid-century American style. 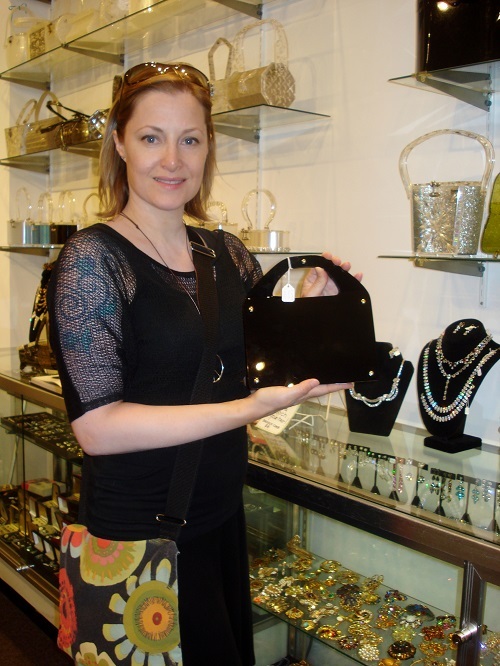 Deco Jewels is an antique specialty shop dedicated primarily to vintage Lucite handbags. This tiny store boasts the world’s largest collection. The owner even wrote a book about it! Lucite, sometimes called acrylic glass, is a modern-era material. It was first used for windshields and submarine turrets in WWII. Designers started working with it because unlike other types of plastic, it doesn’t yellow over time. You might have seen iconic clear Lucite tables and chairs. 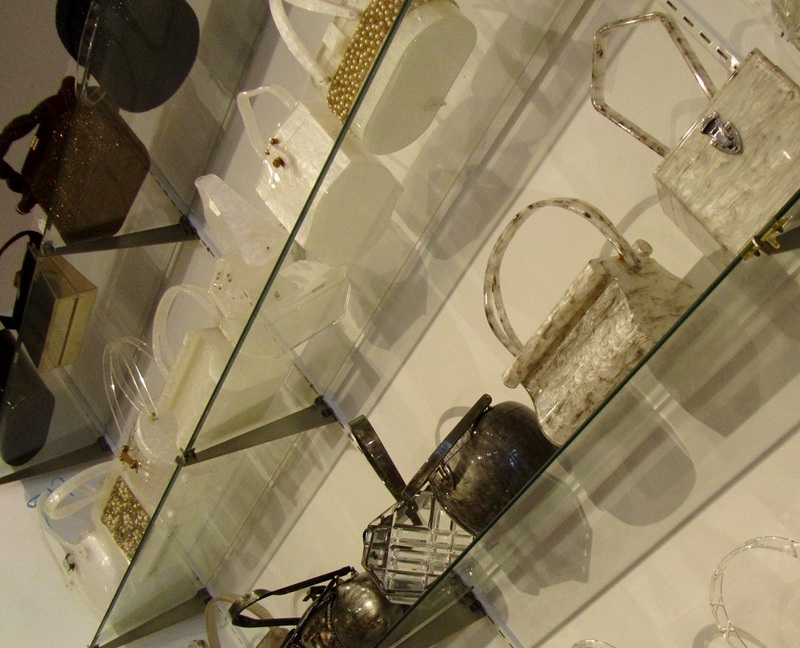 Lucite can be tinted too and is a great vegan alternative to tortoiseshell and mother of pearl. Many were embellished with glitter and metal clasps. These two were made to look like caramel squares. 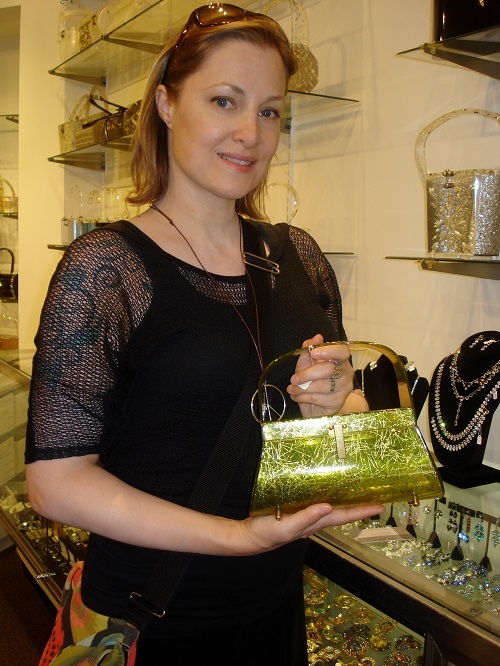 Holding a Lucite bag made me want to change into a fitted blazer, pencil skirt, and kitten heels. 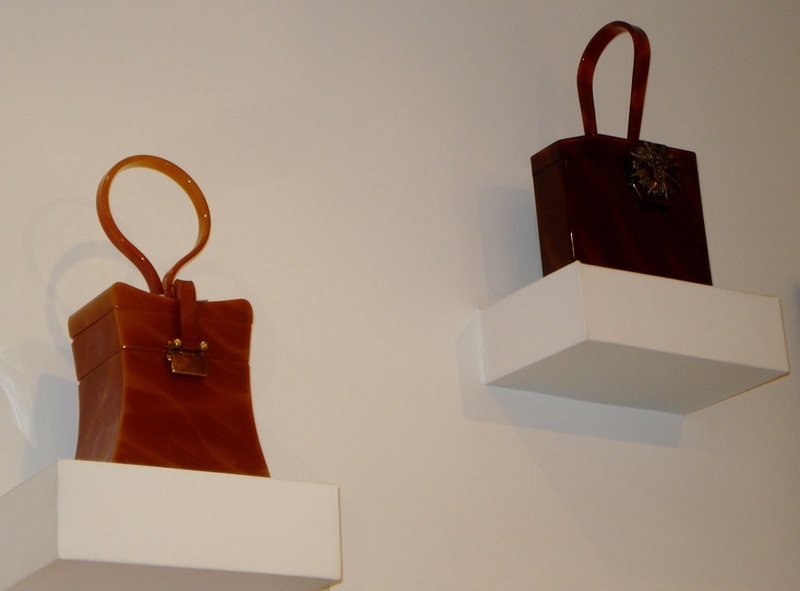 The boxy nature of the handbags made adding secret compartments an option. This one came with its own lipstick and powder! 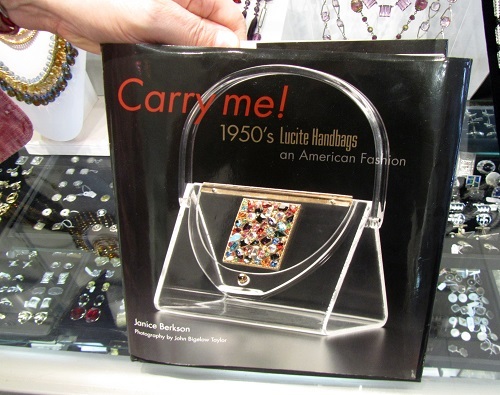 From Marilyn Monroe to Jackie Kennedy, high-profile, fashion-minded women in the 50s carried Lucite purses. 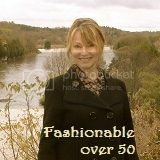 By the mid-60s, fashions started to change. A proper, ladylike look was replaced with a relaxed, boho vibe. 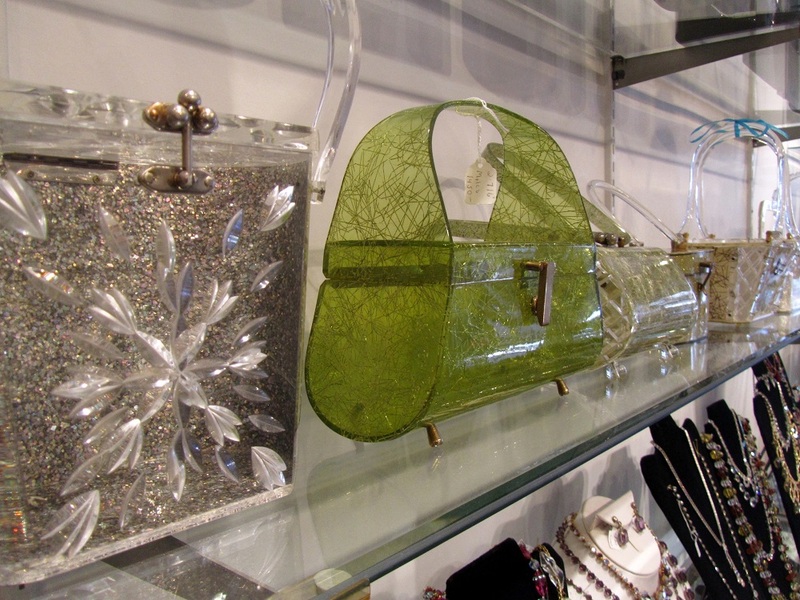 Despite not being a common purse today, people still collect Lucite bags. They’re museum-worthy, but they’d make a great fashion statement. 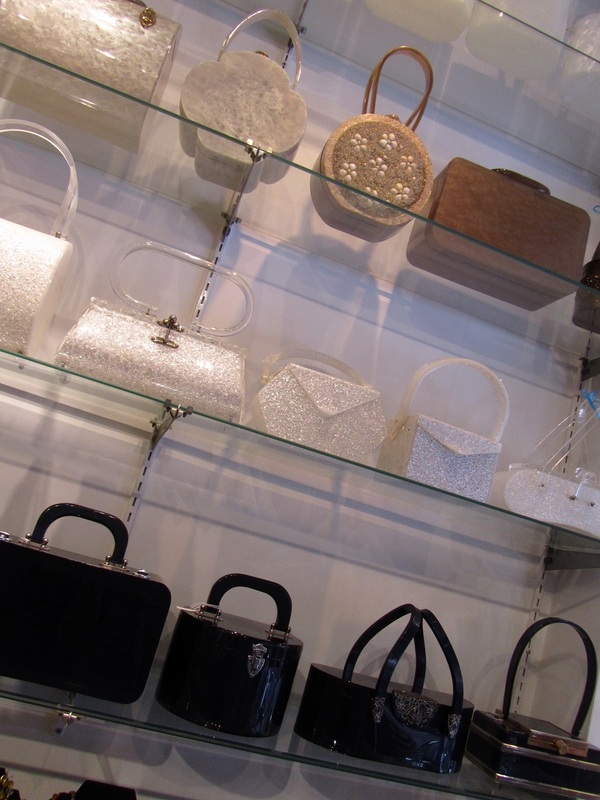 The handbags range from a few hundred dollars to a couple of thousand. 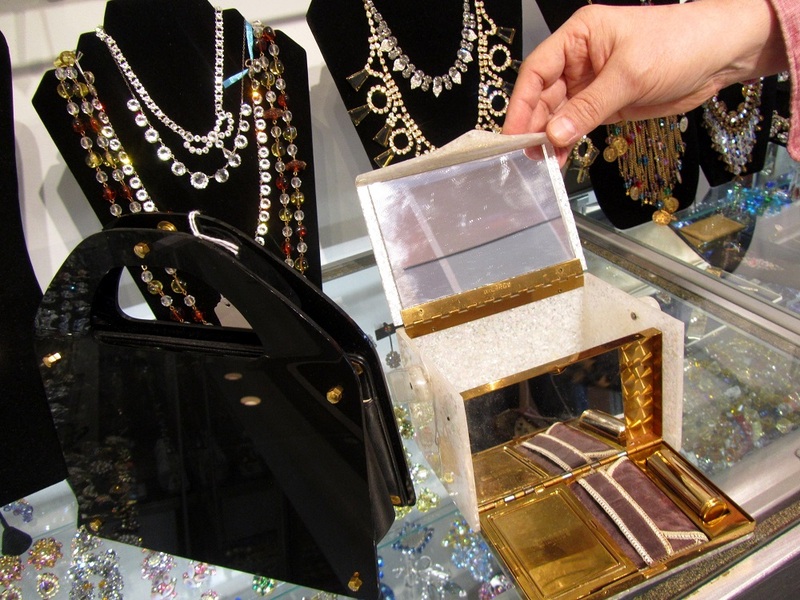 In addition to Lucite, Deco Jewels carries vintage earrings, necklaces, cufflinks and other American goodies from the mid-20th century. The store is small, but not cluttered. 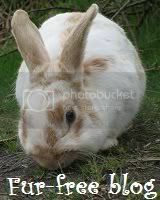 And despite its size, you’ll find yourself enthralled for a long time. 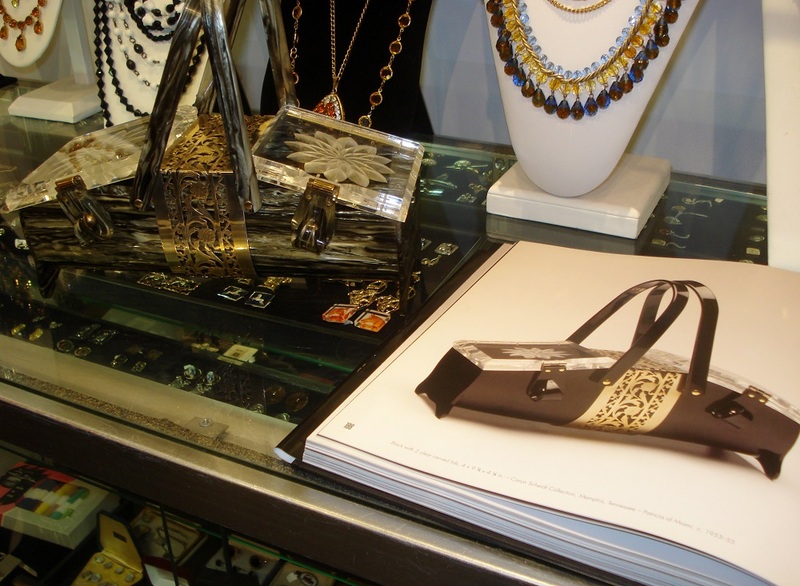 If you’re ever in New York, pop by Deco Jewels at 131 Thomson Street (btwn Houston & Prince). Thanks! I keep adding more NYC posts because I took so many pictures and did so many things that week. 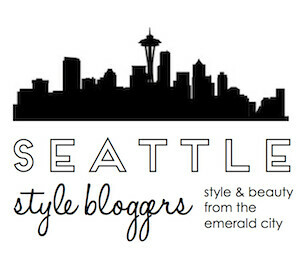 It’s great to relive it while writing for the blog! I have to be honest, when I heard the words LUCITE I thought of the material that was used to make various styles and parts of women’s high heeled shoes. Often the clear heel. I certainly didn’t realize it was used on submarines. 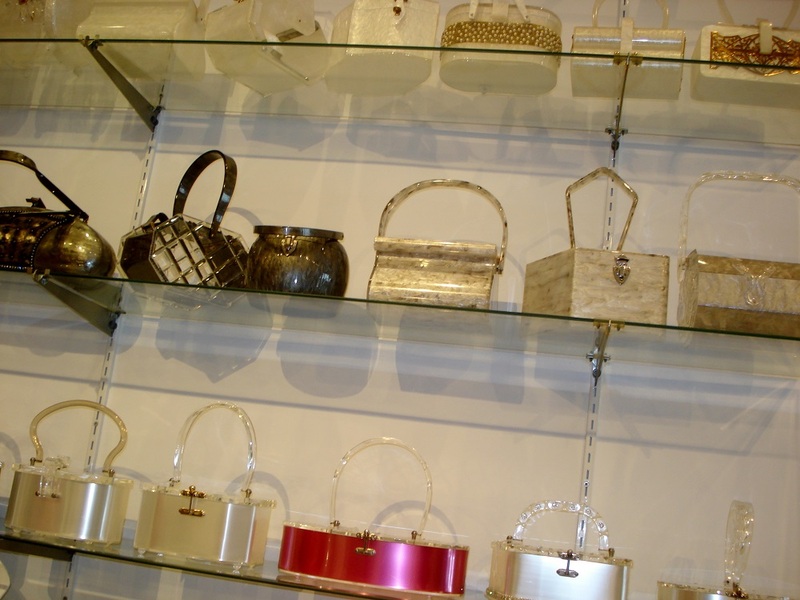 Lucite is obviously a very adaptable material so it’s no surprise that it is used to make purses. 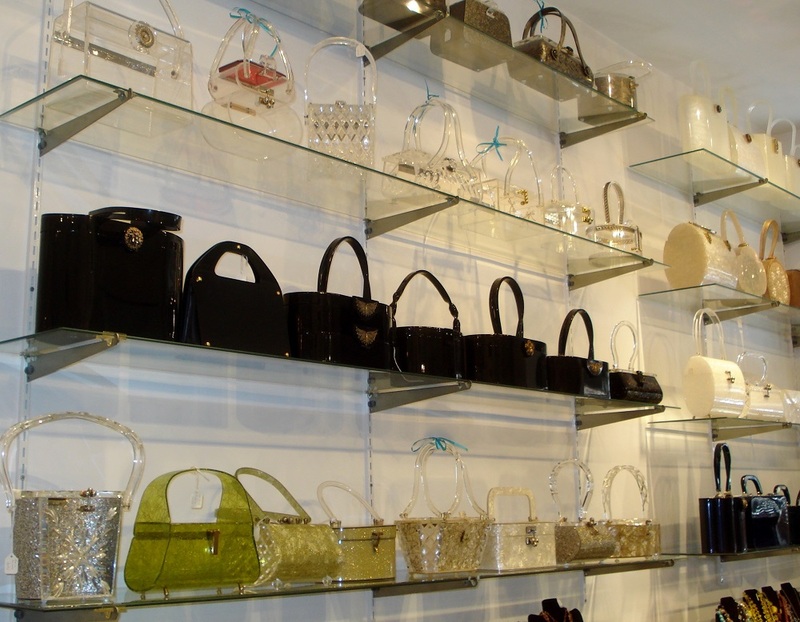 That is so cool that you got a history lesson and a peek at the worlds largest collection of lucite purses in such a tiny store. It must have been fun looking at all the different purse designs. LOL! You’re so right. There’s a certain type of shoe with a Lucite heel that is associated with a different style altogether! It’s such a versatile material. Shoes, purses, tables, submarines. Glad you appreciate the mini history lesson. Why reinvent the wheel ? 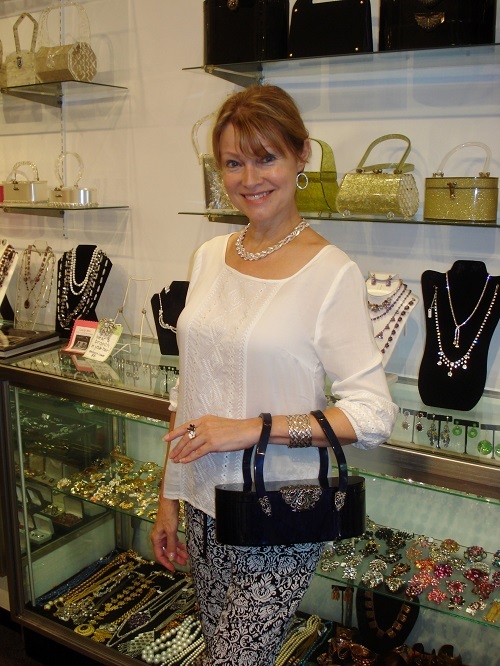 I was going to write about this amazing vintage store we stumbled upon in New York City, but Jean wrote and excellent article and has some interesting facts and fantastic photos to share with you! I enjoyed your post very much. That would be a perfect place for me!! I love bags. . .and you are a beauty with that wonderful little bag!! Thank you! It was such a fun store! Not on our agenda, but a great surprise. Sometimes it’s nice not to stick to a plan–you never know what you’ll find. 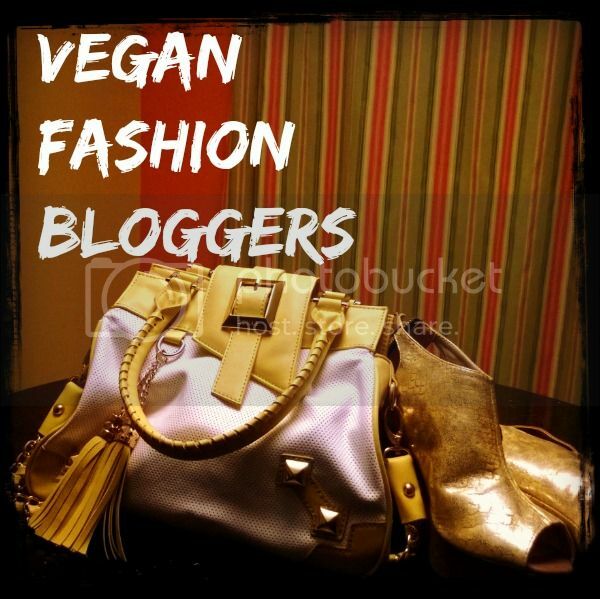 I loved that bag, but it’s definitely the kind of thing I’d need to dress up to carry! So intriguing that Lucite is such a versatile material. In common with my wife, your parents, Jean, are so spontaneous…..”a friend is a stranger not yet met”. I look forward to seeing you next time you’re in NYC. Thank you for writing! You have an absolutely amazing shop! I’ll visit it again next time I’m in New York. Maybe I’ll find the perfect bag then 🙂 I agree with you that, although it would be fun to dress up and carry such a bag, a Lucite bag would look great with anything–even jeans. Oh, I’ve updated the post to give the cross streets–thank you!.